You are here: Home / Homesteading / Gardening / Planting Indoor Seeds + a few outside too! 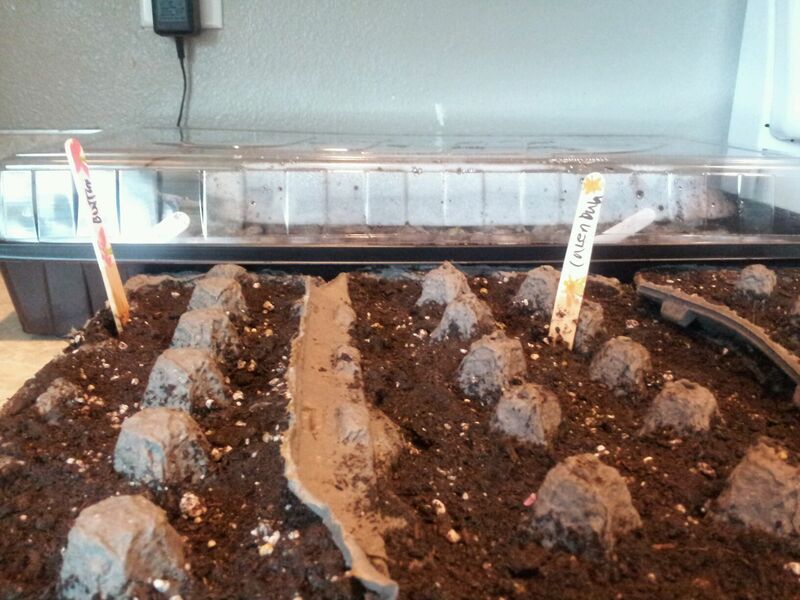 Planting Indoor Seeds + a few outside too! The weather has been so interesting this spring in the Northwest. We have had a day or two that was hot, a day with thunder + lightning, and today it’s been raining all day long. But all in all its been really nice and the temperatures have gone up enough for me to feel safe to begin planting more seeds indoors and outdoors. 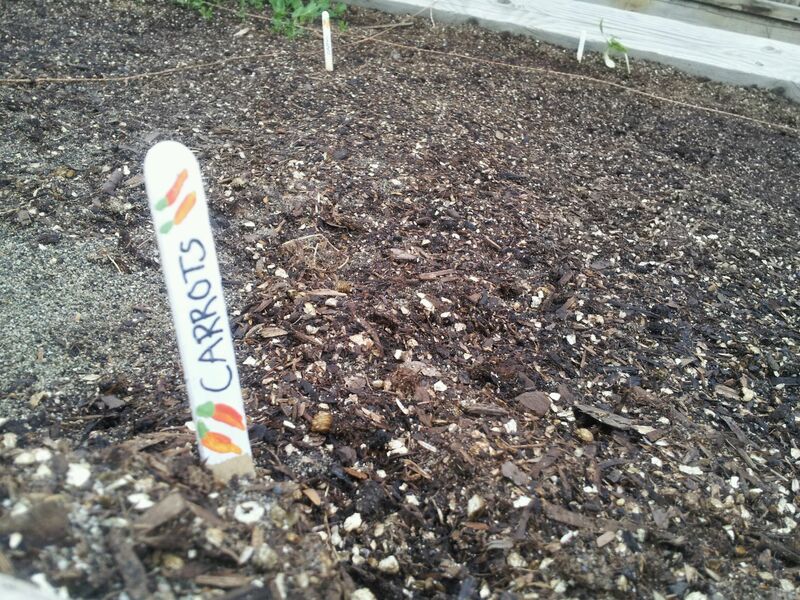 First I went outside and planted my carrot seeds. I am not 100% sure I did my rows really straight, we will see once they start showing their little green tops I suppose. 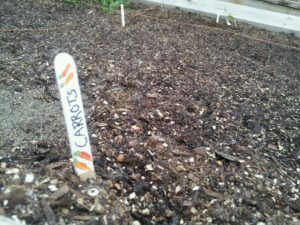 Then you can all mock me then.. Also – I wish I would have kept a section of land with the sand here in my area, as it was kind of difficult to plant carrots in rows when the soil is rough and chunky. Plus I read that carrots like sandy soil..shoot! Carrots were the one plant I could have used my own dirt for. 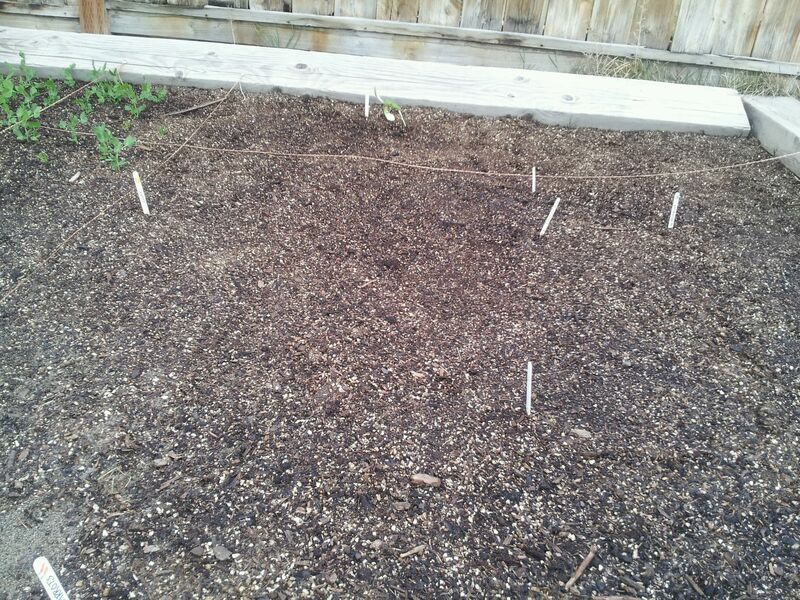 I also planted my lettuce seeds outside as well – both Romaine and a round shaped kind. My little planting sticks look really lonely for now. All sitting there in the middle of the garden…but I know it won’t be long. Some little baby green sprouts will be coming up soon. Next was the indoor starts. I wanted to do my tomatoes, green peppers, green beans, marigolds, basil and cilantro. I found this cute little planting container kit at Walmart for $5.00 which included the soil and the container. 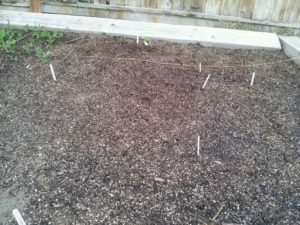 But when I got home I also just used some egg cartons for the others and some good soil – for more seed spots. I poured warm water into the soil, planted my seeds, and covered them up with the lid. Then I waited…and waited. A day went by, then two. But on day 3 my green beans started popping up as well as some other seeds as well. I was thinking it would take at least a week, so I was a bit surprised. Look how fast they all came up. Now its been a week and they are coming up quite nicely. Some never did sprout, which I thought was strange. But I suppose that’s how it goes. Oh my goodness – by the way – while my little cute garden sticks we made looked so cute in the outdoor garden, they wouldn’t fit into the little indoor container with the lid on. I laid them down sideways. The problem is some of them fell over and mixed together and now I can’t remember which seeds are which – ACK! I hope when they get bigger I will be able to tell a little…rookie mistake I know… I should have written on tape and stuck them on the sides of the pan. As a garden newbie I do have a question for you experienced gardeners. 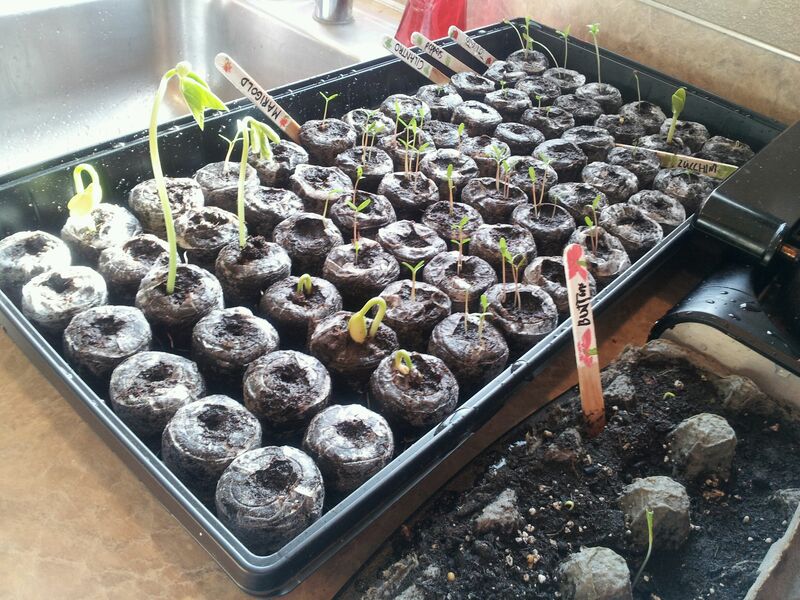 How big do you want your seedlings to get before you replant them outside? Have you started your indoor starts as of yet? What are you planting? 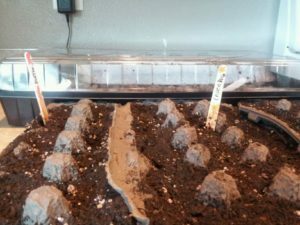 We live in Richland…my husband is a fantastic gardener so I can brag him up a bit….we already have harvested some lettuce in our garden, peas are up and should blossom in a couple weeks, he planted the tomatoes and peppers inside and already transplanted them outside. Really, he is amazing (and so taken)! That same thing happened to me with my garden sticks! I layed them down then didn’t remember which side was which! Ha… glad I am not the only one! 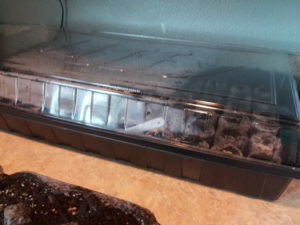 I wait until it isn’t too cold at night to plant my indoor seedlings. I like a few sets of leaves on the tomatoes, but you don’t want alot of roots coming through the bottom of the soil. You’ll want to introduce your seedlings to the outdoors during the day and bring them in to “harden them off.” Be sure they are well watered before you put them out to “sun themselves.” Because the weather has been so unpredictable, I purchased a few nursery grown tomato plants for a jump start on tomatoes so we can have some before my little seedlings catch up! We have a large strawberry bed and rhubarb; we also plant lots of heirloom varieties of tomatoes, sweet peppers, beans, zucchini, herbs, carrots and cucumbers. I think my green beans already have some roots coming out of the soil, so should I take them outside now?